MANCHESTER, Tenn. (AP) — Everyone loves Kendrick Lamar — from the toughest customers in Compton to the crunchiest fans at the Bonnaroo Music & Arts Festival. Lamar spoke with The Associated Press in his dressing room minutes before his highly anticipated set that capped what amounted to a new faces of rap segment at Bonnaroo. Detroit's Danny Brown started the run, followed by Alabama’s Yelawolf, who paid tribute to The Beastie Boys’ Adam “MCA” Yauch, who died of cancer last month, with a medley of hits, including “Brass Monkey” and “(You Gotta) Fight For Your Right (To Party).” Brown returned to the stage to join Lamar for an encore at the end of the night. That was the case at Bonnaroo, where the crowd finished Lamar’s verses on most songs. A musky smoke cloud billowed into the air as he performed his latest single, “The Recipe,” and ode to the best things about Los Angeles that features Dr. Dre. The song’s chorus of “women, weed and weather” fit the night’s vibe perfectly as girls in bikini tops waved joints in the air to DJ MixedbyAli’s beats during unseasonably cool weather than never got out of the 80s. With Lamar’s set out of the way, he can now return his attention to his much-discussed new album, “Good Kid in a Mad City.” He doesn’t have a release date yet but said he’s been staying tight with his Black Hippy collective of friends despite his move to a major label. And perhaps someday soon, we’ll get to hear his contributions to Dre’s long-anticipated “Detox.” Lamar spent nine days with his idol, something he spent much of his life day-dreaming about. 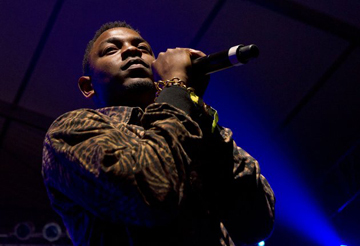 Rapper Kendrick Lamar performs at the Bonnaroo music festival in Manchester, Tenn., Thursday, June 7, 2012.